When you think of Tesla vehicles, you usually think about sleek lines and rapid acceleration. With its new vehicle, it’s gone in a very different direction. With a 0-60 speed of five seconds, the new Tesla Semi truck won't leave anyone behind at the traffic lights. That said, it still has impressive acceleration, just of a different kind. When packed to its 80,000lb maximum gross weight, it can get up to 60mph in 20 seconds, which is seriously impressive. Once moving, it has pretty decent range too. Depending on weight and configuration, it can do between 300 and 500 miles. 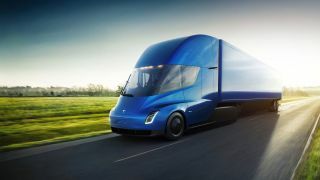 According to Tesla CEO Elon Musk, 80% of routes that trucks make are 250 miles, so will be fine with the Semi. Of course, this isn't the situation for all journeys, and there currently isn’t the infrastructure to support these vehicles being recharged, so it will be interesting to see if Tesla injects funds into developing this infrastructure before the vehicle enters production in 2019. One of the most impressive things about the Tesla Semi is the ability to drive in Convoy Mode. What this means is that a series of Semis would be able to take instructions from a primary truck, allowing for one driver to effectively drive three trucks, or possibly more. What’s important to state is that while the technology might be in the Semi, that doesn’t mean it’s really to start being used on the road. There will have to be extensive testing and legislature before you’ll start to see convoys, but it’s exciting to hear that a major player like Tesla has got to this stage, at least technologically.